At least this is the case for the fast-growing sectors of health, IT and high technology, whose function, according to Castells and Hall (2004), is to generate the key materials of the information economy. 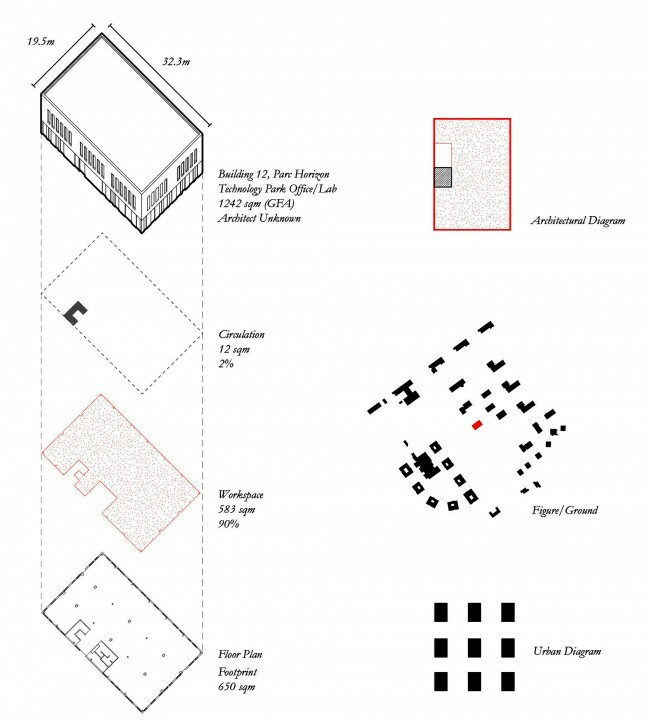 As late as 1950, industry was located downtown, allowing for the development of specific social diagrams and forms of collectivity. The contemporary equivalent, technopoles, choose peripheral locations. 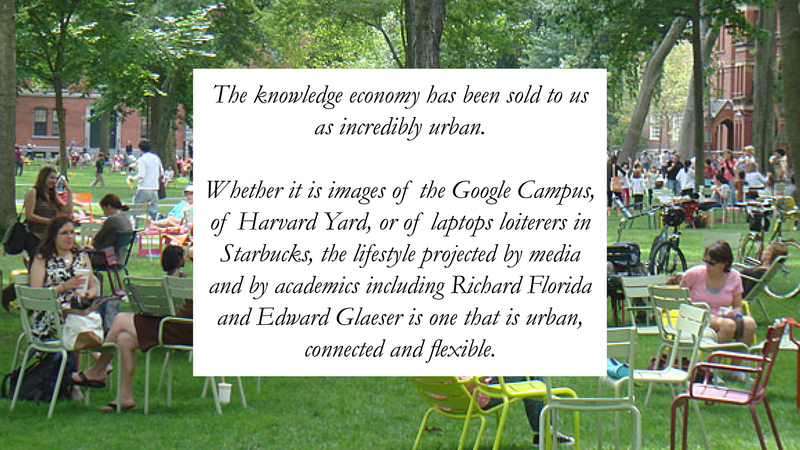 These reject urban exchange, not only between individuals, but also between companies. 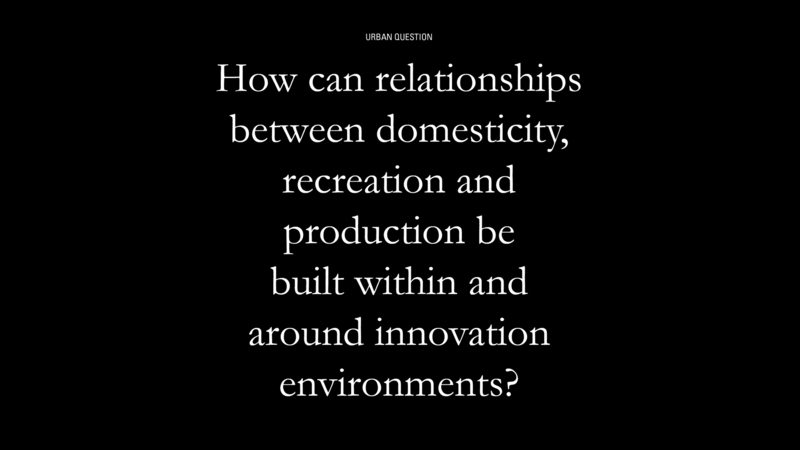 This conflicts with contemporary discourse on urban environments as innovative milieu. Innovation environments are perceived as urban. This reflects a specific lifestyle represented in marketing brochures, literature and real estate speak. However it often isn’t realised. Technopoles are typically government projects that are created in order to develop a particular sector of the economy. Therefore, the most interesting place to observe their creation is not in the global financial centres, whose economic fate is tied to larger forces, but in second-tier cities who compete fiercely to attract and retain global enterprise. The most strategic municipalities build communities of small and medium companies around larger ‘anchors’ (companies or universities), often using the business park or technopole as a mechanism to do so. 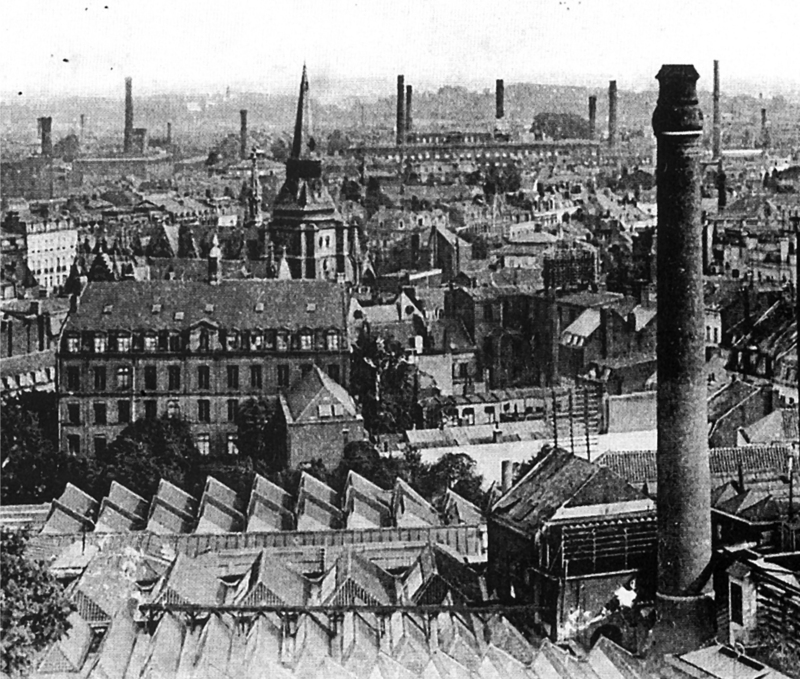 One of the more interesting is Lille, in northern France, previously a textile powerhouse and in decline until the 1980s. 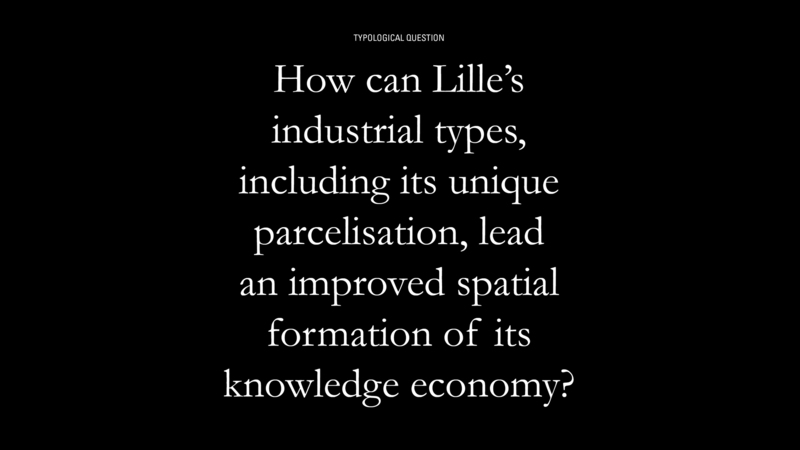 Lille was European Capital of Culture in 2004, an important milestone in its transformation from an industrial economy to a knowledge-based one. 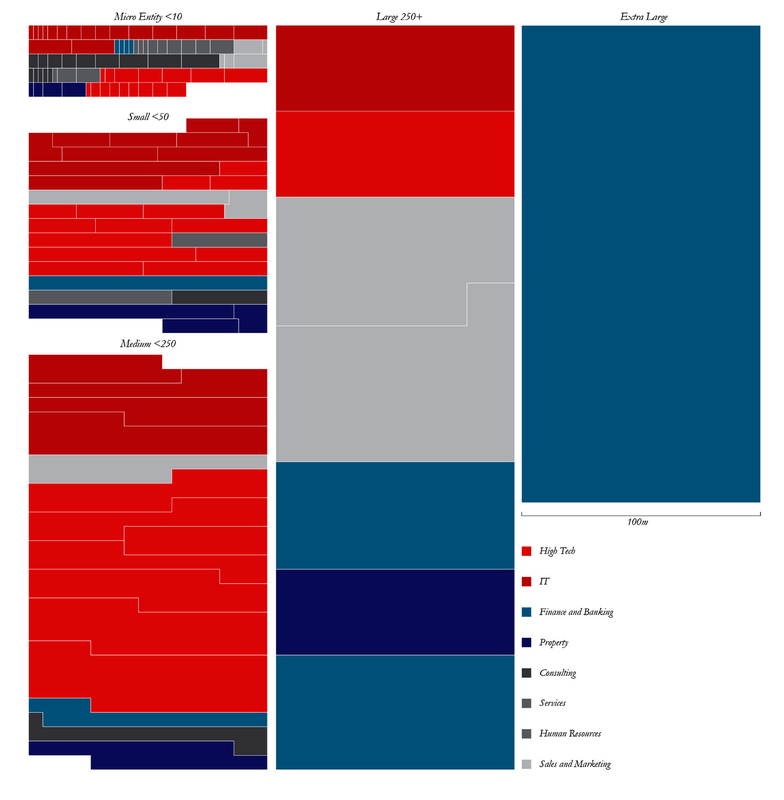 Lille will be the case study of this thesis. When the Euralille project was brought to Lille, then-mayor Piere Mauroy secured its central location by agreeing to locate economic projects throughout the metropole as counter-weights to its pull. These, along with Euralille, became Lille’s ‘Sites d’Excellence’. For each, public funds were directed to business development as a community service. However, rather than the urban, civic, setting of Lille’s industrial period, all except Euratechnologies are post-urban. They mostly follow the logic of the suburban business park and are advertised as implicitly better places to do business than elsewhere in the metropole. 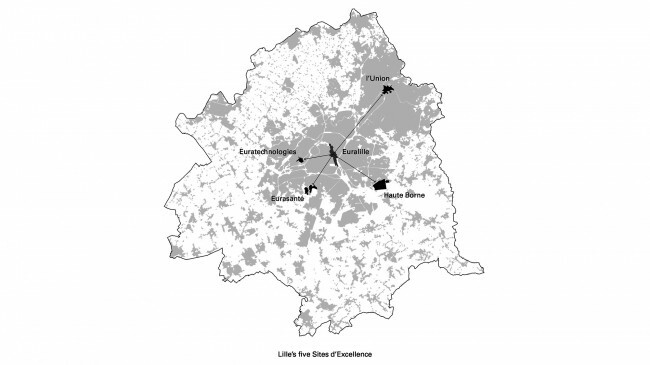 While there are four nominated technopoles in Lille, there are over 70 ‘Parcs d’Activité’. Most are more than 1km across, necessitating a peripheral location. They are an alternative economic geography distributed across the metropole, largely avoiding Lille’s world-class rail infrastructure. This is reinforced by a metropolitan planning scheme heavily reliant upon zoning. 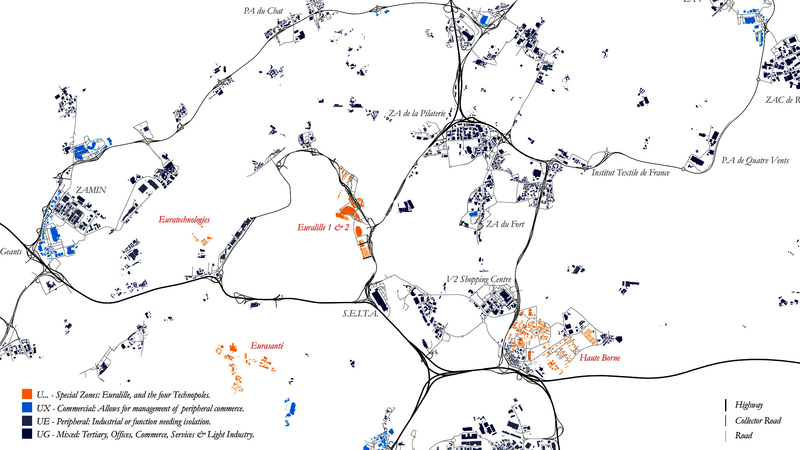 The urban structure becomes apparent when the Parcs d’Activité and major roads are mapped together. While Lille has some of the best rail infrastructure for a city of this size anywhere, its commercial and economic space is structured around roads. 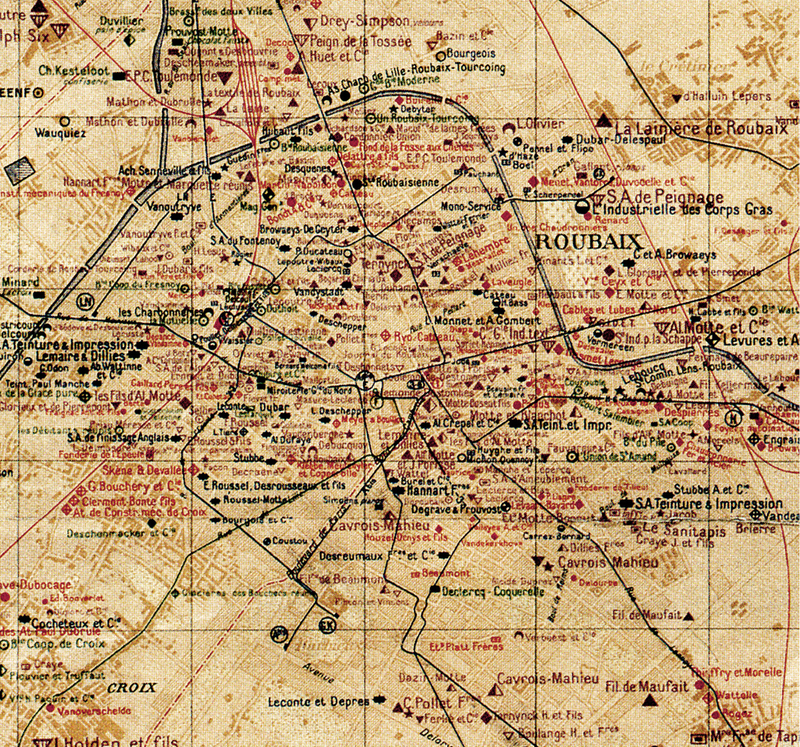 Haute Borne (bottom right) was built as part of a new Cité Scientifique in greenfield land on the outskirts of the historical city. 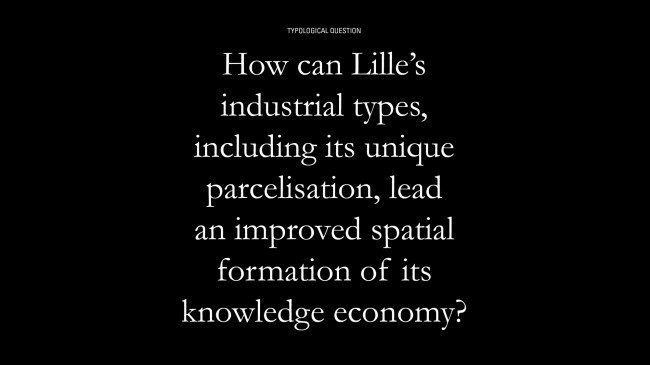 This was the first strategic action taken to amplify Lille’s tertiary economy (1968) after the industrial collapse. To found the Cité Scientifique, the Science and Technology portion of Lille University (Lille 01) was relocated from the city centre. 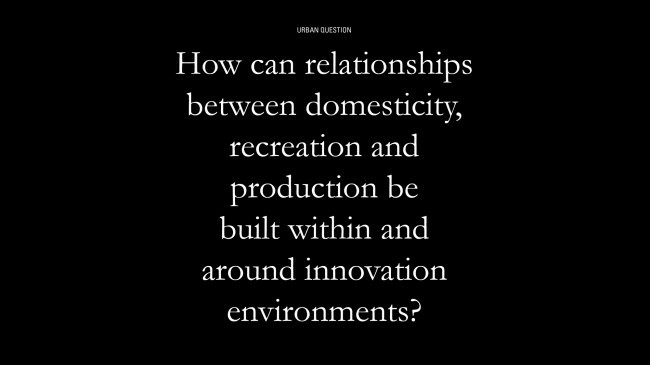 This allowed for the development of an adjacent technopole. While mooted early on, and part of the peripheral strategy, Haute Borne Technology Park was not mobilised as a project until 1999. The American science park was used as the model. 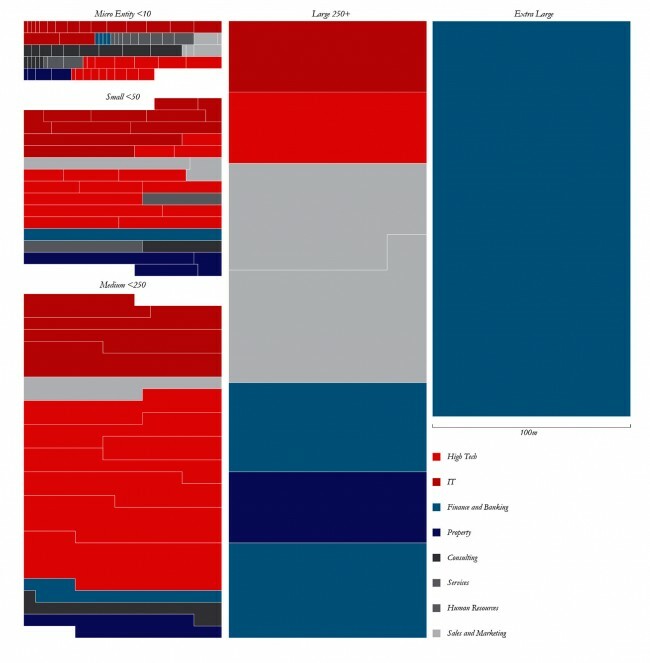 The idea was to link research with the market. 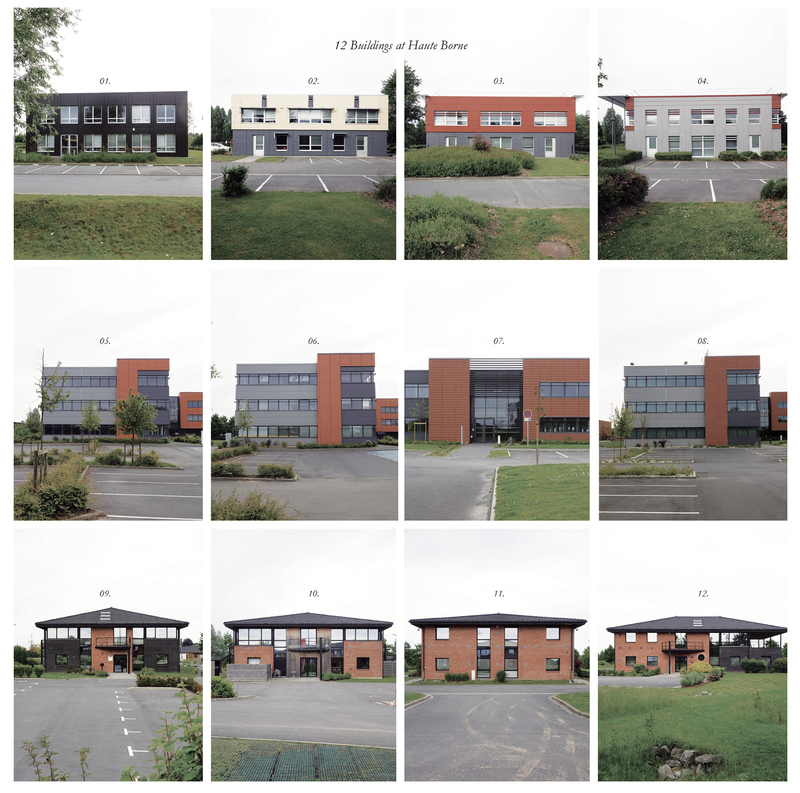 However, Lille 01 is not a particularly strong research institution and the mix of occupants at Haute Borne is less than half high-tech and R&D, though it is marketed as such. Despite this, it is the most popular technopole in Lille. This case study is taken from the top row of images on the left, Europarc. 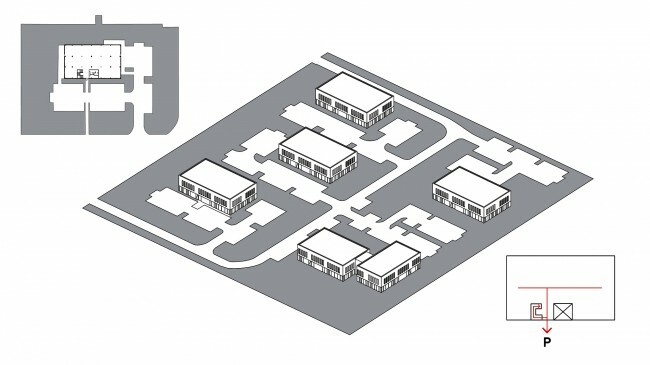 Floor space is maximised through a single entry that leads straight from the parking lot, creating an extremely efficient plan. An arrayed urban diagram is reinforced by glazing on all sides, requiring buildings to be set back from one another. Parking and landscaping fill this void. 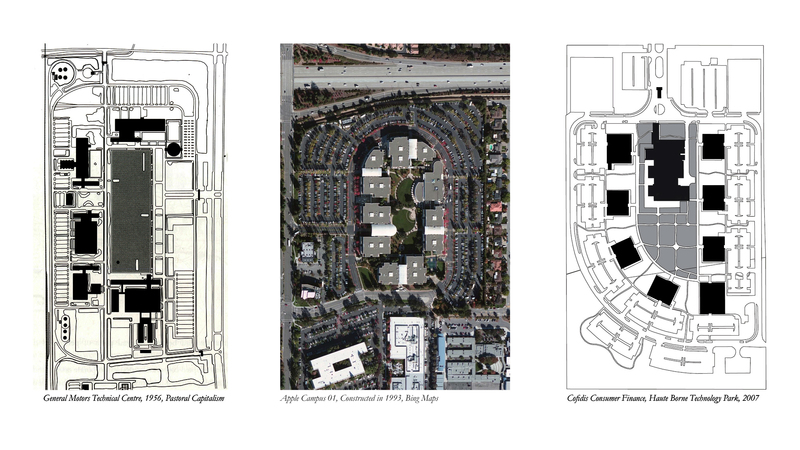 When there is at least one company per building, an arrayed urban disposition addresses itself solely to the parking lot. 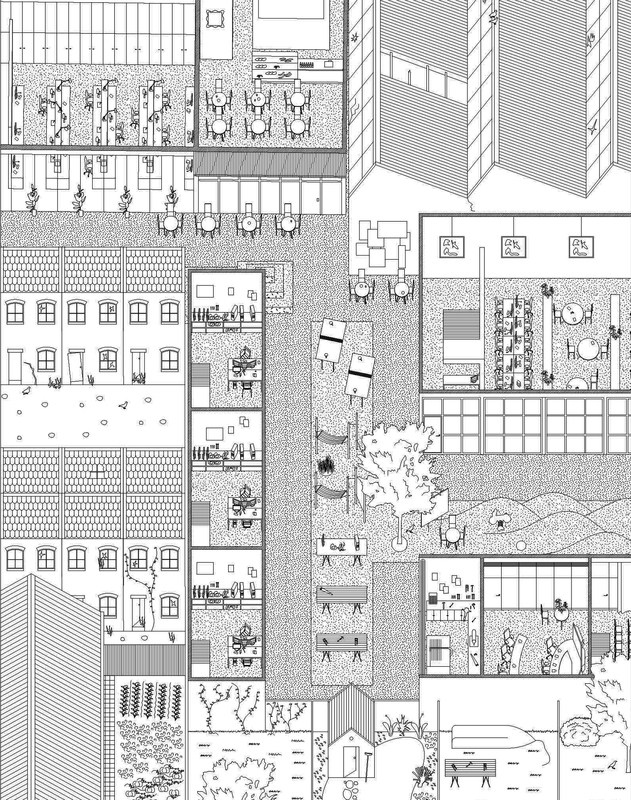 Little attempt is made to encourage interaction between buildings, and by extension companies. 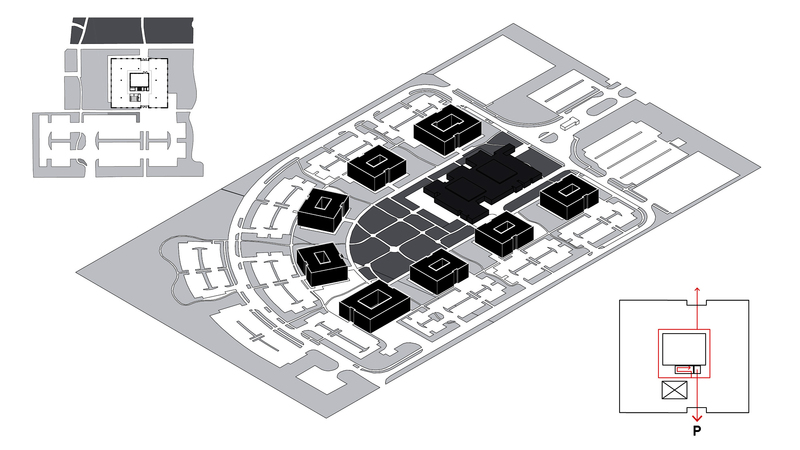 As larger organisations attempt to form into groups, buildings remain addressed to the parking lot by necessity. The arrangement of the lift and stairwell enforce this. 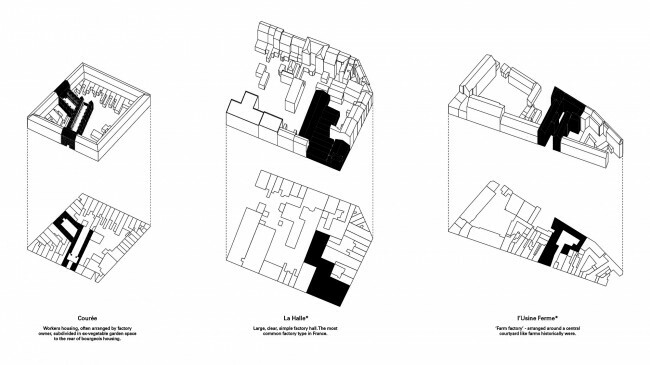 Therefore rather than facing in to the central courtyard, as the urban form suggests, buildings have their back to it. 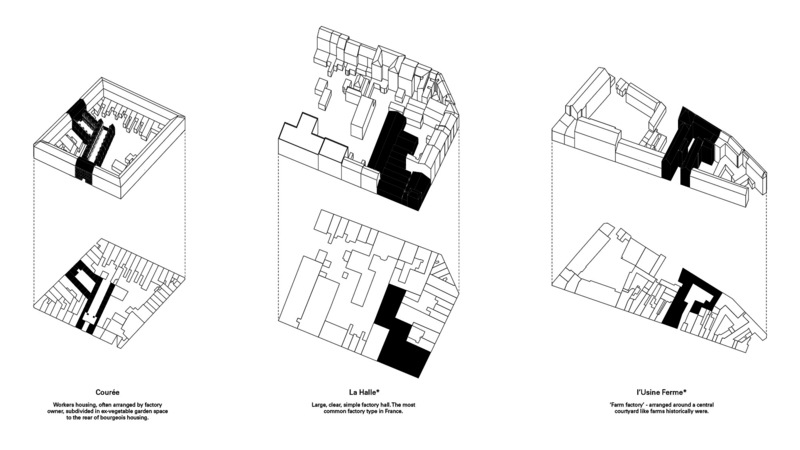 Isolation persists, and will remain while parking is so closely tied to the architecture. 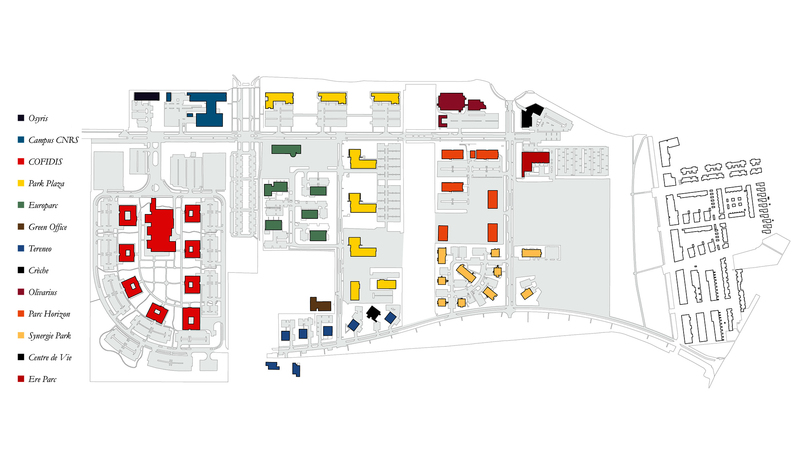 Cofidis’ corporate campus type can be traced back to the general motors technical centre of 1956. 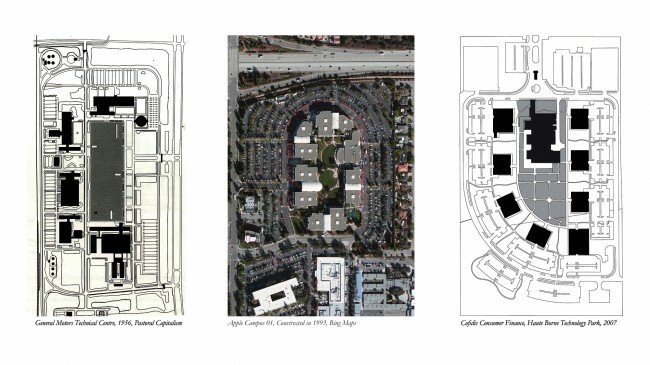 According to Louise Mozingo (2011:13), these were originally built to house middle management research and development divisions. They feature a central courtyard around which the buildings are arranged. Surface car parking is outermost. This type reinforces the corporate desire for isolation. An analysis of the businesses located at Haute Borne reveals an eclectic mix, where high tech businesses are in the minority. Of the 129 companies located within the park 72 are in high tech, representing only 35% of the workforce. These tend to be the smaller companies within the park, as is evident opposite. On the one hand, this suggests that the park could have a much tighter urban form and perform better against its stated aim of synergy. On the other, it reveals that the science park is not functionally specific, attracting banks, estate agents, sales and marketing agencies amongst others. In short, the occupancy contradicts the marketing. 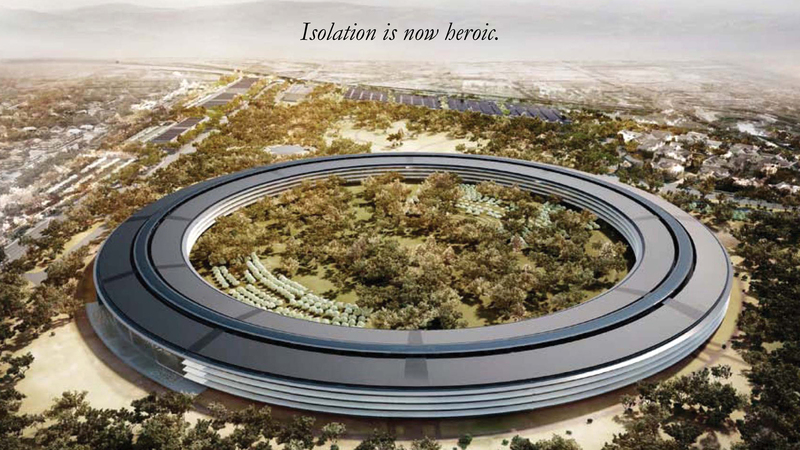 Haute Borne claimed an enormous amount of land under the auspices that a critical mass of high technology businesses may co-locate synergetically. 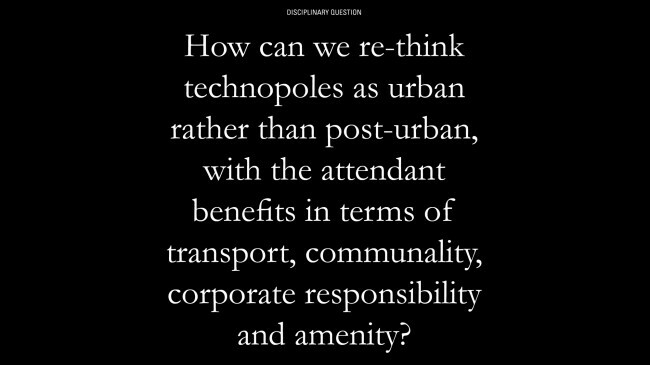 The technopole was therefore forced to the periphery of the city, to car-dependence and therefore to an urban form that in fact encourages isolation. The potential for interaction has been blown apart by surface car parking. This hinders synergy. 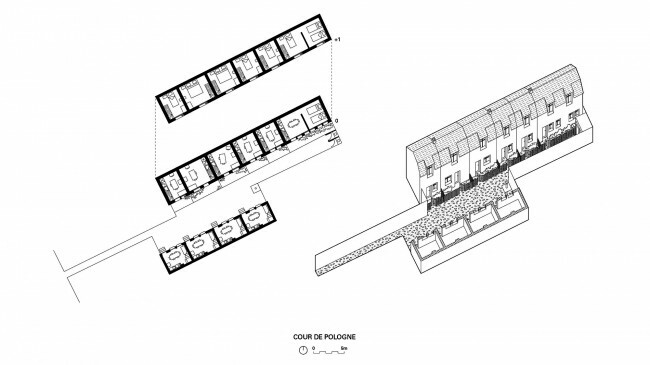 This is paradigmatic of a broader trend across the metropolis, where large quantities of cheap land are allocated under the ‘UG-Mixed’ zoning as receptacles for Lille’s tertiary economy, never far from a collector road or freeway. It undermines the massive investment made by the city in rail-based collective transport, and creates two competing urban structures for the metropolis, one based on high speed roads, the other on rail. Road is winning. Business park types are not specific nor functional. The sole logic is cost. 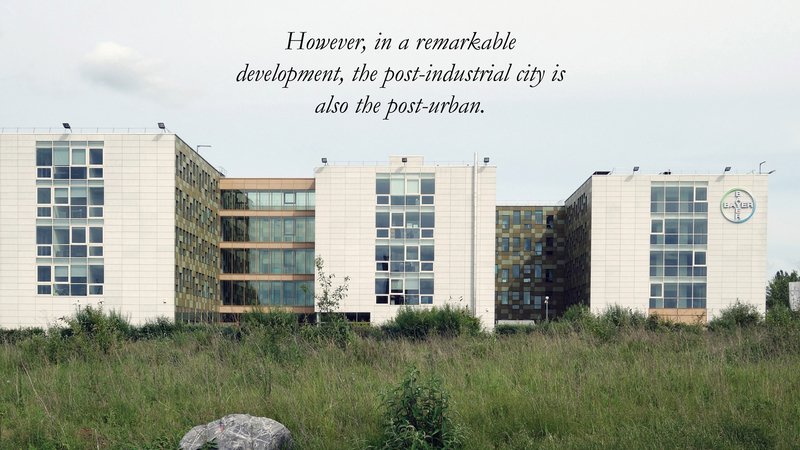 Indeed, Haute Borne’s copious, cheap land undermines the potential for businesses to locate in a more urban context. We might ask why it is that Cofidis Consumer Finance chose Haute Borne and not Euralille for its new headquarters, for instance. 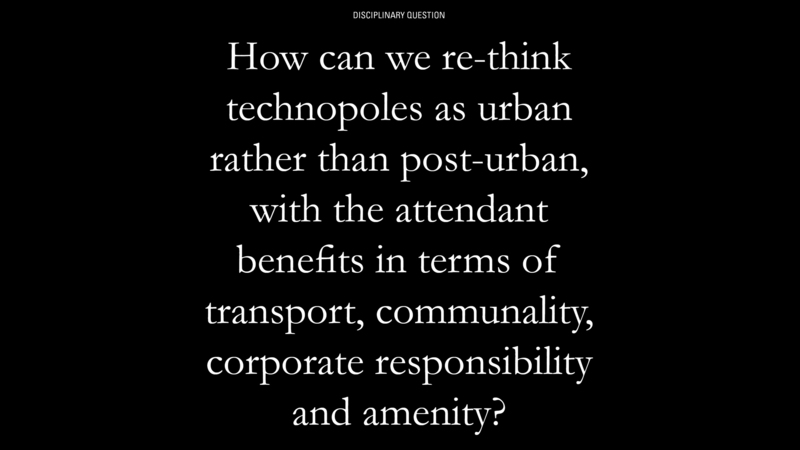 The technopole, corporate campus and dom-ino types, as found at Haute Borne, are open to challenge at an architectural, urban and metropolitan scale on transport, land use and ultimately even functional grounds. One hundred years prior to the emergence of technopoles in Lille, community organised itself around industrial production when smoke stacks competed with church spires for prominence on the skyline. 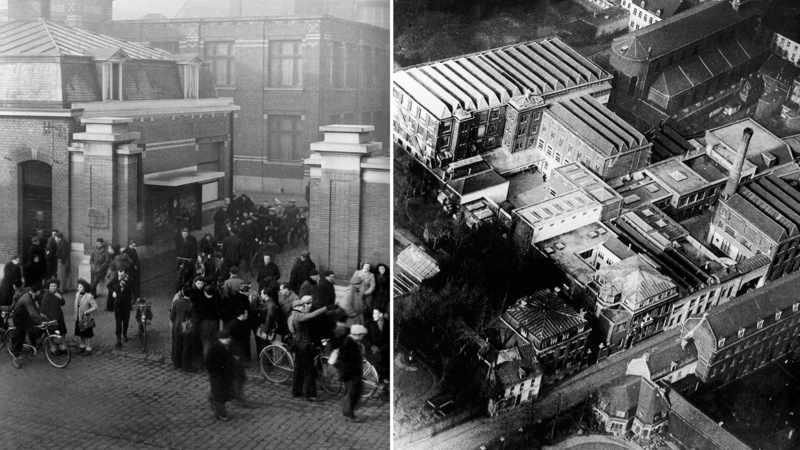 During this time, factories were deeply integrated in the city fabric of Lille, Roubaix and Tourcoing with larger spinning factories sitting amongst smaller dying and weaving workshops. These were clustered, synergetically, in town, not on the periphery. Some people worked from home. The 1881 cadastral plan above is an example of the city fabric that emerged in industrial Lille. Visible within it is the large plot of a factory, and the small units of the Courée, a form of collective dwelling for the working poor. The compact form of the Courée allowed the working poor to locate within walking proximity of their workplace. The resultant relationship between domestic and productive space allowed for the factory whistle to be audible, for a more reliable workforce and for both men and women to earn an income. Further, the wife of the factory owner would visit employees during important occasions, part of a paternalistic relationship between employer and employee (Miller, 2003: 87). 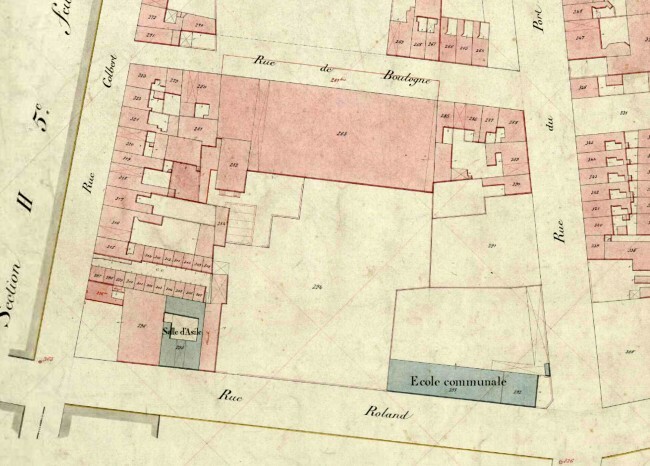 While today many factories and Courées have been torn down, what remains is the cadastral parcels, leading to Lille’s unique parcelisation. 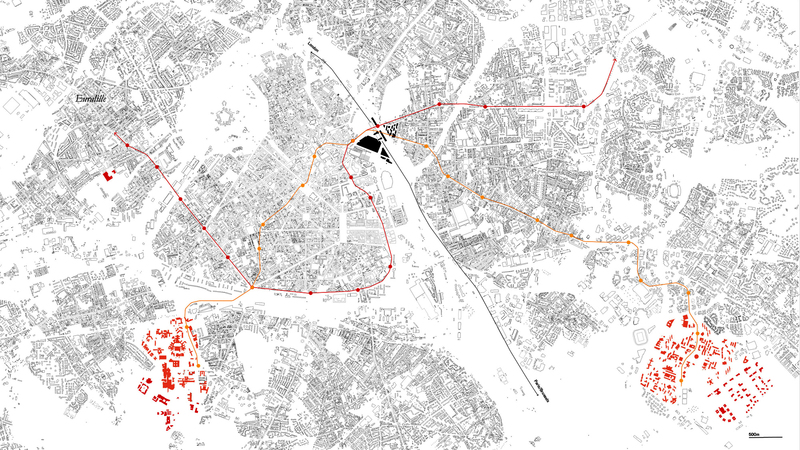 This is a unique, latent opportunity within the city, and one with the potential to turn historical examples such as the above into projective tools. Hall, Peter. Good Cities, Better Lives: How Europe Discovered the Lost Art of Urbanism. Oxon: Routledge, 2014. Miller, Michael. 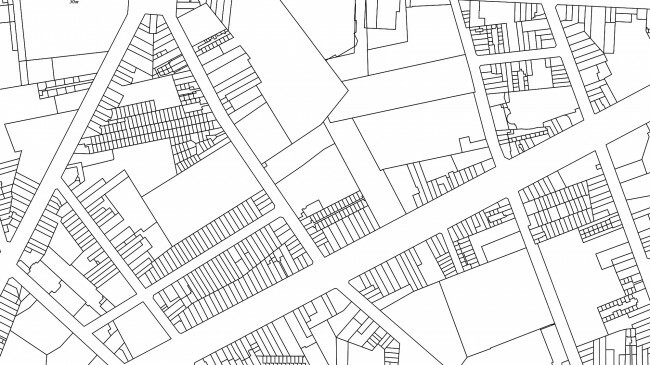 The representation of place: urban planning and protest in France and Great Britain, 1950-1980. Aldershot: Ashgate, 2003. 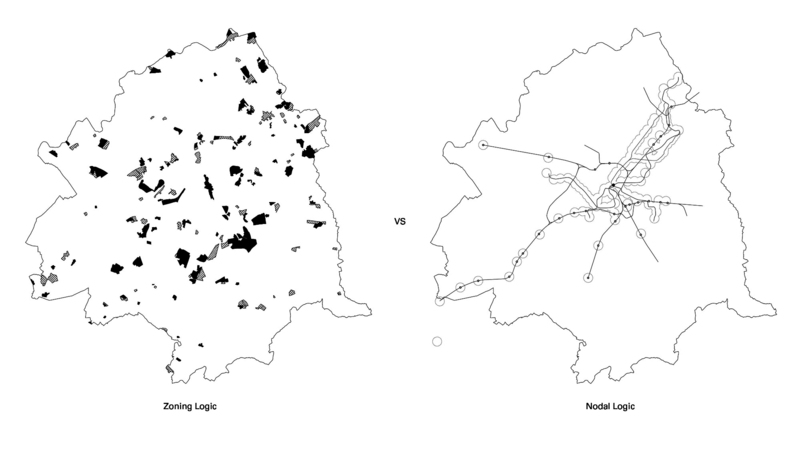 Mozingo, Louise A. Pastoral Capitalism: A history of Suburban Corporate Landscapes. Cambridge: The MIT Press, 2011.